Now, unflavoured gelatin is a perfectly acceptable gelling agent for pâte de fruit. Several recipes, including one of Jacques Pepin’s use it. The first time I attempted pâte de fruit, I made them with gelatin, and they were very nice – a little more springy than the ones made with pectin, I find. That was certainly not what I produced this time. I did not measure my raspberries correctly last week. I used fresh ones, left to sit in a very warm room, and may have packed them into the measuring cup a little too vigorously, so that I had too much mass for the amount of gelatin I used to set the fruit/sugar mixture. I also did not use jam, but instead used more berries. Although I thought I took that into consideration when boiling the mixture down, clearly I miscalculated. I scooped the whole “bloody mess” (the fresh raspberries I’d used in it really did produce a copious amount of artery coloured juice) into a Mason jar and banished it from sight in the fridge, overnight. 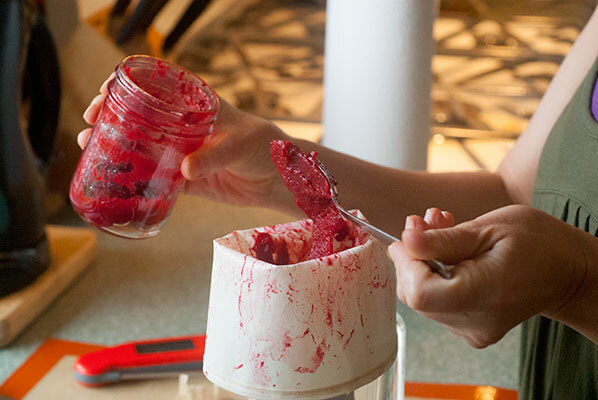 The last option was by far the most practical for my purposes, so the next morning I put the failed pâte de fruit in my ancient food processor and produced a very smooth and thick raspberry puree, which mounded slightly on a spoon. I liked the consistency of it. I returned it to the Mason jar for another day. When I looked at it the pâte de fruit the next morning, it was a very thick paste that held its shape on the spoon. I dropped a small amount into a piping bag without tip, and squeezed out a nice little blob. This was going to work. 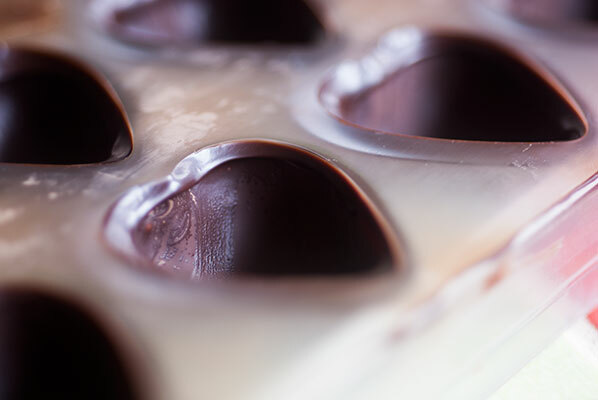 I used another of Pam’s suggestions from the Ecole Chocolat curriculum, to ensure a good release of the chocolates from the molds: I applied a very thin layer of liquefied tempered cocoa butter to the cavities and left it to set for a few minutes. 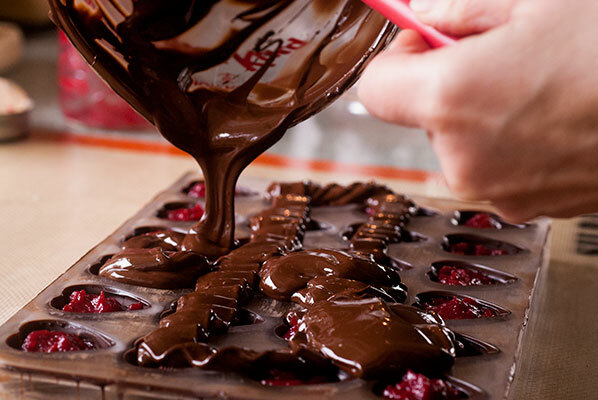 This also helps to ensure the chocolates are glossy, and adds no difference to their taste. I tempered 500 grams of 70% dark chocolate couverture (I used Callebaut)and poured it into my favorite, easy to work with, 24 heart shaped cavity mold. This mold is very forgiving, as it doesn’t have too many crevices and the sides have a gentle slope. When the cavities are set, I pipe the blended pâte de fruit into the mold, trying very hard not to overfill the cavities, as is my wont, then give the whole thing a smart rap on the counter top to settle the filling. 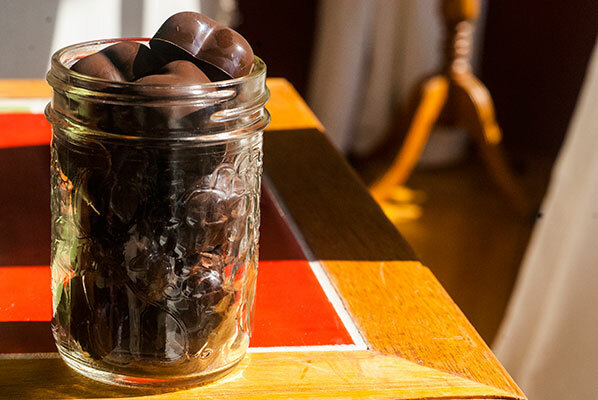 I put a backing coat of chocolate on the mold, scraped the excess off neatly, and put it aside to set, briefly, in my refrigerator – I know, I know, this is NOT the correct method for setting chocolate, but it was soooooo hot today, I suspected they would not set properly in any room in the house. And I left them there for only five minutes, before putting them on a counter in front of an open door with a cross breeze. 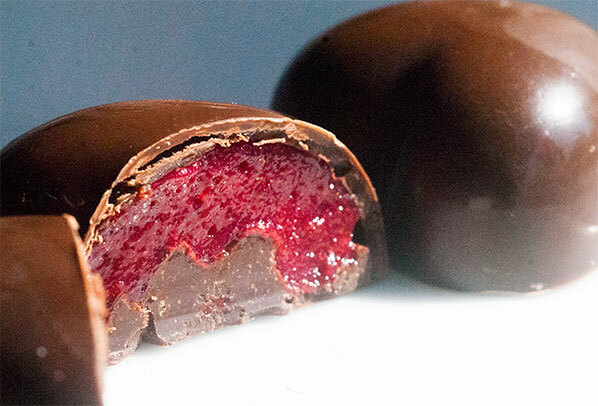 They released from the molds much more easily than I had anticipated on this hot day, and I must say, the combination of smooth dark chocolate and tart raspberry jelly is delightful. In fact, the whole lot of the chocolates lasted just one day. My excuse is the heat, but they really were such a nice texture and flavour combination, they were irresistible. 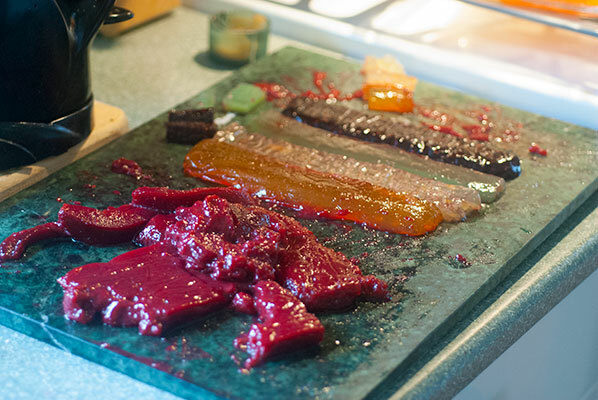 Perhaps mixing it up and allowing it to chill for another 24 hours gave the failed pâte de fruit /jelly a chance to re-set. 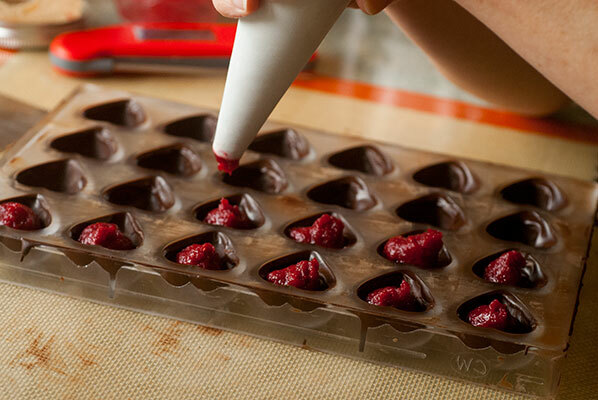 In any case, this consistency is, I think, perfect for filling chocolates. Line an 8×8 inch square baking dish with a piece of parchment paper that extends 4 inches beyond the rim*. 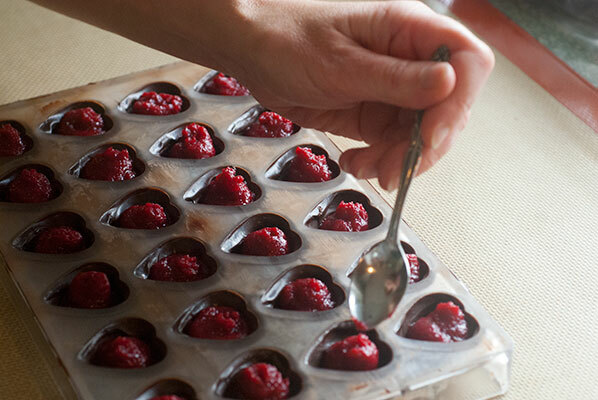 In a food processor, puree the raspberries with the 1 cup of sugar. Strain the puree into a medium saucepan. Boil the puree over moderately high heat, stirring often, until reduced to 3 cups, about 10 minutes. In a small bowl, sprinkle the gelatin over the water in an even layer. Let stand until the gelatin softens, then heat the water in a microwave for 20 seconds, until the gelatin dissolves completely. 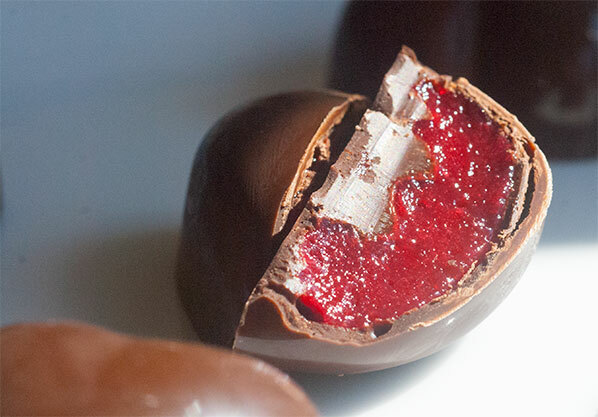 Stir the melted gelatin into the raspberry puree, then pour the mixture into the prepared dish. 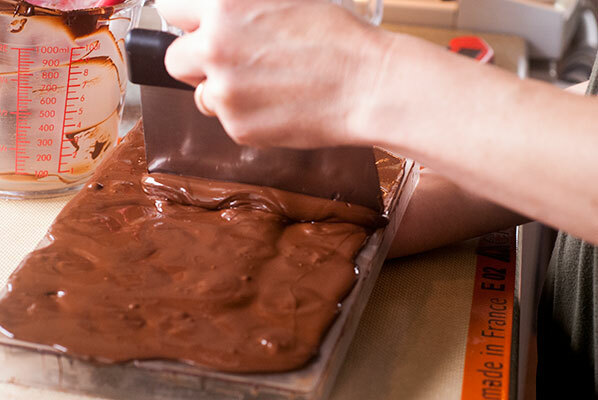 Let cool to room temperature, then cover with plastic wrap and refrigerate overnight. Break chunks of set pâte de fruit into the bowl of a food processor. Whir until smooth. 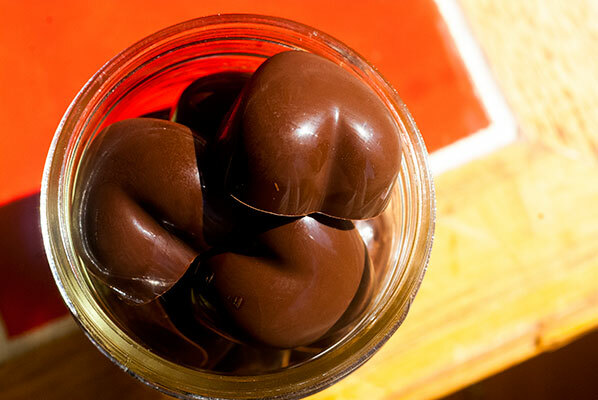 Store pâte de fruit paste in a clean glass jar in refrigerator until ready to use. *I prefer to use a glass one, so that no taste is transferred to the mixture, but a metal pan will chill faster once the mixture is in the refrigerator.